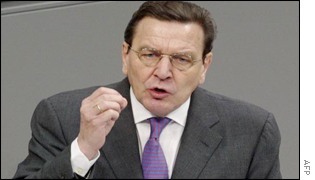 Chancellor Schroeder told the Bundestag that Germany wanted a peaceful solution to the Iraq crisis. He said he was concerned that any military action could undermine joint efforts to combat international terrorism. Germany is bearing responsibility - responsibility in the struggle against international terrorism, responsibility for enforcing the unconditional disarmament of Iraq, responsibility for peace. Iraq is doubtlessly ruled by a dictator, whom every one of us would prefer to get rid of sooner rather than later... Iraq definitely does not have nuclear weapons, nor any long-range carrier systems, which could take what it does not have to their targets. According to everything we know so far, the latest mission of the UN inspectors in Baghdad has certainly led to progress. The inspectors, who will present another report to the UN Security Council tomorrow, have never left any doubt about the necessary scope of their mission. Second, Iraq must cooperate comprehensively and actively with the UN Security Council and the weapons inspectors. We need absolute clarity about Iraqi weapons of mass destruction, and, if they exist, their final destruction. Third, the power to decide about the progress made by the inspectors and about all consequences rests with the UN Security Council. Fourth, the decisive instrument for the abolition of prohibited Iraqi armament programmes is and remains an effective inspection and verification regime. It must be expanded and intensified in line with the requirements. Fifth, it is our goal to establish lasting structures to contain the dangers emanating from Iraq, for disarmament, and stability in the entire region. Iraq's neighbouring states - but not only they - must be included more strongly than in the past. The explosive situation in the region and the weapons potentials existing there require comprehensive cooperation. We are firmly convinced that there are still alternatives, it is not too late to bring about the disarmament of the Iraqi regime by peaceful means - not only in the UN Security Council, not only in the EU, but also here in the Bundestag we will continue to work for a broad majority for a common position in this respect. I do not want to accept that the only choice is waging a war together with our friends or giving peace a chance without them. We can disarm Iraq without war. "We all do what we have to do for the peaveful disarmament of Iraq"
Europe and Iraq: Who stands where?